The Sony Xperia Z2 Tablet is the brand's updated version of the Sony Xperia Z Tablet - in the same way that the Sony Xperia Z2 smartphone has been updated to take on the new HTC One M8. In a similar vein it's clear that Sony's now got its sights firmly set on taking down the iPad Air - the Xperia Z2 is lighter, more powerful and thinner and it's also waterproof. Of course simply spurting specs does not make a great tablet - it's how it integrates into your daily life, whether it can survive the commute and of course the ever-important battery question - can it survive a day. The Xperia Z2 is thinner than before, now measuring in at a truly impressive 6.4mm making it the thinnest tablet in its class and one of the thinnest consumer devices in the world. Thankfully Sony has made sure the build quality is up to the task, so while the Z2 is thin and light (only 426g) it never feels flimsy. The matte back is solid and resilient and it's also grippy. You'll also be pleased to hear those sharp corners are now gone with the Z2 tablet matching the design changes of the Z2 smartphone. On the front you'll immediately notice how much space there is surrounding the screen, the bezels on the Z2 are significant. With this being primarily a landscape tablet we can see the advantage of having a space for your hands but ultimately it does make the Z2 so wide that you may struggle to hold it one-handed, a tablet for the commute, this is not. It's a superb piece of minimalist design, with most of the focus going on the display. Sony's kept the same 1200x1920 Full-HD display that featured on the original so while that means it won't be able to go toe-to-toe with the iPad Air in terms of pixel density it's still one of the best panels out there. The reason for this is the range of extras that Sony has included with the display including its Triluminous and X-Reality for mobile technology. What this translates into is class-leading colour reproduction as well as sharper and clearer images and video making the Z2 a truly media-focused powerhouse. The Z2 comes running the latest version of Android KitKat 4.4.2 as well as Sony's own UI overlay. We've not always been massive fans of Sony's UI for Android in the past, as we mentioned in the Sony Xperia Z1 Compact review it simply doesn't translate well for mobile - using up precious screen real estate that could be better spent on apps and widgets. On tablet however things are different, add to that the fact the Z2 comes with Sony's latest version designed for KitKat and it all starts to make more sense. The UI feels far less intrusive which, combined with the ability to set themes, means the Z2 tablet is considerably more customisable than its Android rivals. You'll also be able to download externally made themes so if Sony's selection aren't up to scratch there are some real doozys on Google Play as well. Sony still provides a considerable amount of bloatware including its own version of albums, music, calendar as well as Sony Select, Sociallife, Track ID TV, PlayStation, Remote Control, Smart Connect Xperia Link and Xperia Lounge. As you can see that's quite a list. Luckily most of them are reasonably useful with the Walkman app once again proving to be one of the best music apps available on a smartphone or tablet. Other highlights include Remote Control which lets you use the IR blaster on the top to control your TV while Smart Connect is a useful way of assigning rules to connected devices like headphones and speakers. The rest we could take or leave, Socialife is an OK social feed aggregator and Sony Select is simply a curated selection of apps for your tablet. Connectivity is well and truly catered for with NFC, WiFi and Bluetooth 4.0. That means you'll have Bluetooth Low Energy support as well. 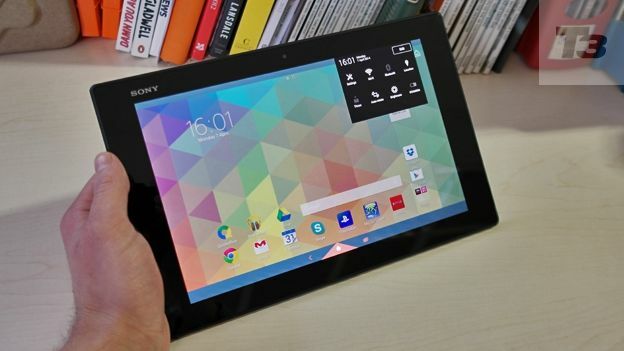 The Xperia Z2 tablet features a 2.3GHz quad-core processor along with a substantial 3GB of RAM. All of this adds up to a tablet with some serious computing power. Just moving around the interface it's immediately clear that this tablet has been designed for the long haul with the responsiveness being some of the best we've seen. Storage is a mixed affair with either the option of 16GB or 32GB. No, it's not much but the pricing does mean it matches up against the iPad in terms of value for money, plus there's the ability to add an extra 128GB of storage via the microSD card slot. Finally we'll touch on the camera - something that more and more people are beginning to use on tablets. We still can't see any advantage with doing it but just in case, Sony's included an 8.1MP Exmor RS for mobile sensor. The sensor itself is actually quite good, although one of the problems with shooting on a tablet is that any imperfections are now all the more present, as such we'd still recommend using either a camera-focused smartphone or camera. Despite having to power a 2.3GHz quad-core processor and Full-HD display, the Z2 has superb battery life. With normal mixed usage you should be able to get a day, maybe even a day and a half without any problem depending on how much video you watch. Turn on Sony's Stamina mode and this drastically increases. The feature turns off all non-essential applications and wireless features which means that when the screen's off the Z2 tablet will be using almost no battery at all. With this on we were able to get two days of light browsing and video watching, of course if you're using wireless headphones this will drastically reduce that figure down to maybe a day. The Z2 tablet is a marked improvement over the original, it's powerful, light and inexplicably thin. Where it falters is in the design, not in terms of how it looks but more in how functional it is. The Z2 tablet might just be too wide for some - the bezels on the side are considerable but it 's certainly not a deal breaker. We know why it's wide - the trade-off was making it ultra-thin but then still having to find the space for the battery. Which brings us on to battery life. It's brilliant, making the Z2 tablet an even more desirable proposition when you realise the power that it can command. The Z2 tablet is the best 10-inch Android tablet - it's powerful and packed full of features that make it in some ways better than the iPad Air. If you're looking for a large-tablet and want to keep Google as your main port of call then the Z2 should be at the top of your list.